ScotRail used to operate a fleet of Class 150/2 "Sprinters" until early 2005. The prototype 'Sprinter', 150001, was a 3-car DMU built by BREL in 1984. Its first appearance in Scotland seems to be 16th May 1985, when it visited Glasgow Queen Street. The unit also came north to work a shuttle service from Edinburgh to the Haymarket Depot Open Day on Saturday 24th August 1985. 150001's next spell Scotland was longer, It formed a Glasgow - Oban special on January 3rd 1986, to mark the opening of the new station building at Oban. The unit then spent 6 weeks based at Inverness depot, used on scheduled passenger services to Aberdeen, Kyle and Wick. On February 17 1986 it was back in the West Highlands, working the 09:50 Glasgow - Fort William. A second prototype unit was built by BREL, and while numbered as 154001, visited Scotland in 1987. Haymarket depot got its first allocation of Sprinters in June 1987. Recently delivered 150255/257/259 were sent from Newton Heath to Haymarket depot, to start staff training. Prior to use in regular service, the Sprinters were used on a number of excursions, taking them to fairly unusual destinations. Sprinters 150255+259 worked an Edinburgh - Stranraer excursion on August 2 for the 1987 Galloway Games. Another 3 units, 150283-285 were newly delivered from York Works, ready for introduction on to the Edinburgh - Dundee and Edinburgh - Bathgate routes from October 1987. Further units were sent to Haymarket from October 1988, until by May 1989 the fleet was up to 18 units, ready for introduction on to the Edinburgh - Dunblane, North Berwick and Dunbar, and 'new' Fife Circle services. 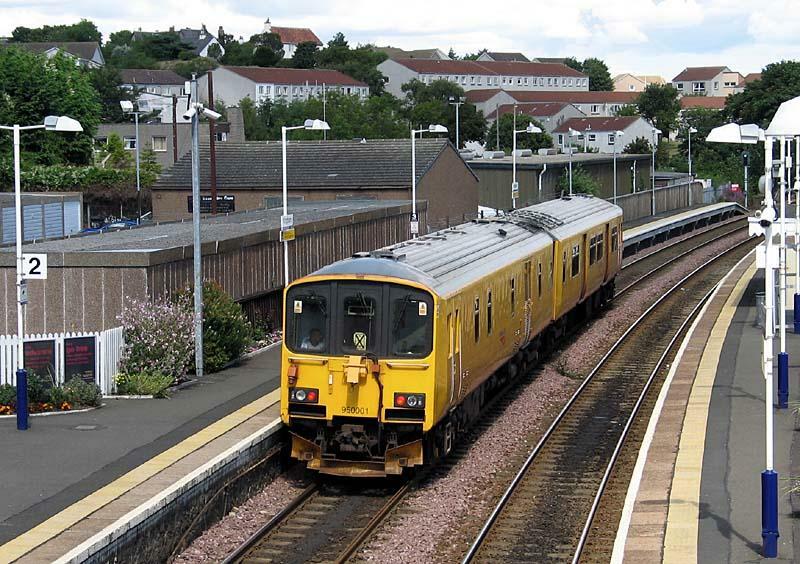 In 1991 the Edinburgh - Dundee service was extended to Aberdeen using Class 158s, and two surplus 150s were sent to Cardiff. Two further units were exchanged for class 156s in 1994. On 25 March 1996, 150285 was named EDINBURGH-BATHGATE 1986-1996 to celebrate the 10th anniversary of the line reopening. It carried this name until the end of November 2004. 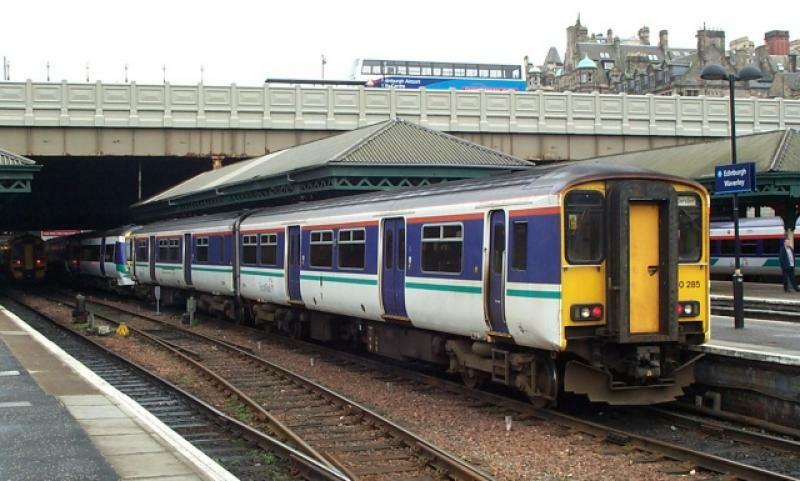 Introduction of the second batch of Class 170 Turbostars, and cascading of class 158s onto local services saw 2 units sent south in the Autumn of 2000. During the winter of 2000/01, the remaining 12 units were overhauled at Glasgow Works and turned out in the ScotRail Railways white and purple livery, strangely with a narrower green stripe than other classes. In addition to the regular Fife, Bathgate and Dunblane work, the 150s sometimes visited Glasgow Queen Street. The class also made occasional appearances on the Edinburgh - West Calder - Glasgow Central route. The final 12 Class 150s were displaced by 'Suburban' Class 170s funded the Scottish Executive. The units lasted just long enough to see in the First ScotRail era and get new branding. The first to depart was 150256 on 16 November 2004, and the last was 150258 which headed south on 4th March 2005. All these units went to Cardiff, although three units spent some weeks on loan to Neville Hill depot (Leeds). Class 150 units based in England have visited various Works for overhaul or repair. Hunslet-Barclay at Kilmarnock refurbished and repainted (150133-150 & 150201-03/05-07/11/15-18/22-25) for First North Western from 1999-2000. Brodie Rail at Kilmarnock, repaired 150135 for Northern Rail in 2014. Network Rail owns the Track Recording Unit, 950001 (999600 + 999601) which was purpose-built in 1987 based on the Class 150/1 design. This unit has carried several different liveries in it's career. It has been in all yellow since 2005. Created by SC318250 and last modified by Dysgraphyk at 13:12, 12 of July 2014.